French tosafist, exegete, and poet; flourished in the second half of the twelfth century; pupil of Jacob Tam, Joseph Caro, and Samuel ben Meïr (Rashbam). The identity of Joseph Bekor Shor and the tosafist Joseph ben Isaac of Orleans has been sufficiently demonstrated by Gross, who showed that the same explanations given in the Tosafot (Ḥul. 112b; Yeb. 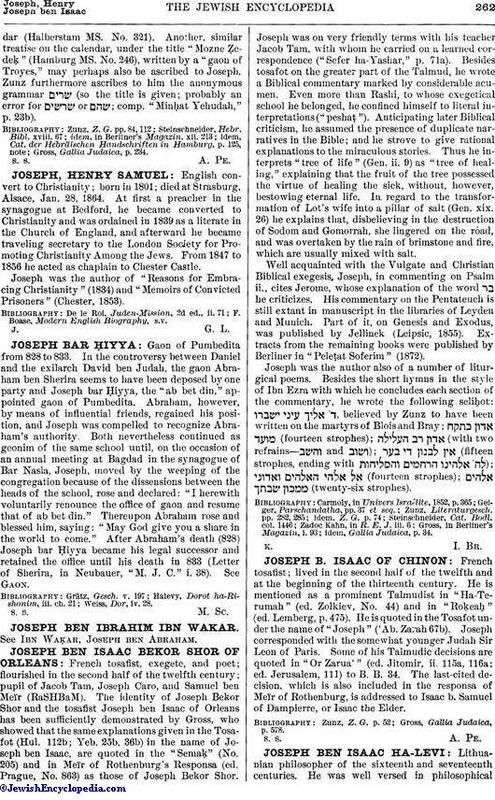 25b, 36b) in the name of Joseph ben Isaac, are quoted in the "Semaḳ" (No. 205) and in Meïr of Rothenburg's Responsa (ed. Prague, No. 863) as those of Joseph Bekor Shor. Joseph was on very friendly terms with his teacher Jacob Tam, with whom he carried on a learned correspondence ("Sefer ha-Yashar," p. 71a). Besides tosafot on the greater part of the Talmud, he wrote a Biblical commentary marked by considerable acumen. Even more than Rashi, to whose exegetical school he belonged, he confined himself to literal interpretations ("peshaṭ"). Anticipating later Biblical criticism, he assumed the presence of duplicate narratives in the Bible; and he strove to give rational explanations to the miraculous stories. Thus he interprets "tree of life" (Gen. ii. 9) as "tree of healing," explaining that the fruit of the tree possessed the virtue of healing the sick, without, however, bestowing eternal life. In regard to the transformation of Lot's wife into a pillar of salt (Gen. xix. 26) he explains that, disbelieving in the destruction of Sodom and Gomorrah, she lingered on the road, and was overtaken by the rain of brimstone and fire, which are usually mixed with salt. Well acquainted with the Vulgate and Christian Biblical exegesis, Joseph, in commenting on Psalm ii., cites Jerome, whose explanation of the word he criticizes. His commentary on the Pentateuch is still extant in manuscript in the libraries of Leyden and Munich. Part of it, on Genesis and Exodus, was published by Jellinek (Leipsic, 1855). Extracts from the remaining books were published by Berliner in "Peleṭat Soferim" (1872). Joseph was the author also of a number of liturgical poems. Besides the short hymns in the style of Ibn Ezra with which he concludes each section of the commentary, he wrote the following seliḥot: , believed by Zunz to have been written on the martyrs of Blois and Bray; (fourteen strophes); (with two refrains— and ); (fifteen strophes, ending with ); (fourteen strophes); (twenty-six strophes). idem, Gallia Judaica, p. 34.